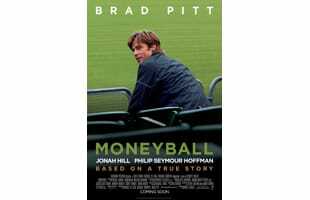 The 2011 movie is the story of Oakland A's general manager Billy Beane's successful attempt to put together a baseball club on a budget by employing computer-generated analysis to draft his players. The movie stars Brad Pitt and Jonah Hill. Trailer Park: Is The Second "Moneyball" Clip A Home Run? Jonah Hill Wants Everything And "The Kitchen Sink"